The Glen House, the new hotel at the base of Mt. Washington, is the ideal place to base yourself for a winter trip to the White Mountains. From the comforts of the guestrooms to the warming fire in the great room and the all day menus at The Notch Grill, it’s a great place to spend a few days this winter. The view of Mt Washington from the great room and many of the guestrooms are dramatic. Guests can take it up a notch by booking an excursion on a SnowCoach Winter Tour at Great Glen Trails, which lies across the road from the hotel. Driven by 4 tracks rather than wheels, the 12-passenger (though they typically seat only 7- 9 persons) Mt. Washington SnowCoach transports guests up to treeline on Mt. Washington, at approximately 4,200 feet, into a sub-arctic world for a truly unforgettable adventure. Upon arrival to the “top-of-the-tour”, guest can usually exit the SnowCoach for a short stay for photo and video opportunities and to enjoy the weather. 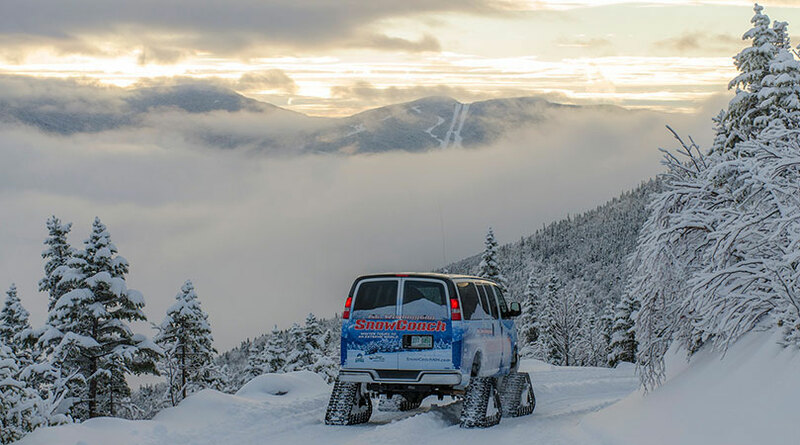 We can drop you off to snowshoe down the Auto Road at any point along the descent – experienced snowshoers may want the full 4-mile trip downhill, while less experienced folks may be more comfortable asking to be let out closer to the bottom. Experienced Nordic skiers (free-heel) may also choose to ski down (however alpine, or fixed-binding skiing, as well as snowboarding is not allowed). SnowCoach tours depart on most days from Mid-December through March depending on weather and terrain conditions. Visit Mt. Washington Auto Road Snowcoach Tours.